Online applications are invited by Employment Generation Department Punjab Recruitment 2018. 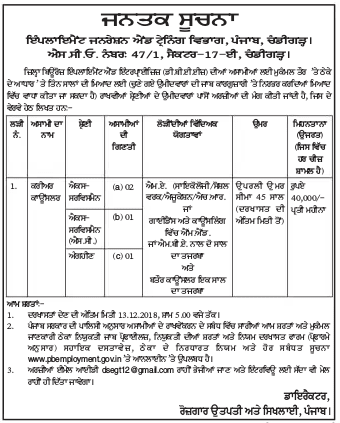 Interested candidates for Employment Generation Department Jobs of Career Counselor Posts. Candidates Can Apply Through the Official Website www.pbemployment.gov.in . Both Male and Female Can Apply Online For Employment Generation Department Punjab Recruitment 2018-19. Name of The Organization : Employment Generation and Training Centre, Punjab. The Candidate Should have MA in Social Work/ Psychology/ Education/ Human Resource. OR M.Ed. in Guidance and Counseling or MBA with 02-years of experience . To know the Selection Process of is based on Interview. The Selected candidates get pay Rs. 40,000/- Per Month. You can send your applications at [email protected] before 13-Dec-2018.